"If Stricker (and O'Hair's) success had been a one-off then the argument that the aging pros have a big opportunity could be dispelled as hogwash but last year's result wasn't a one off. Kenny Perry won with O'Hair in 2012, at the age of 52, Scott Hoch was 53 when he won with Perry in 2008 and there have been a number of winning partnerships in their 40s." Formally known as the Shark Shootout and the Franklin Templeton Shootout and in existence since 1989, this will be the 30th edition of the Greg Norman-hosted QBE Shootout. The QBE Shootout is a 12 two-man team event staged over three days with the following format. This is a very relaxed tournament and I just wonder how seriously the younger players take it. Whether they mean to or not, it must be really difficult for the elite pros to be mentally sharp after such a long year of contending in big events and even majors and previous renewals suggest siding with the older pros makes sense. At the age of 50, Steve Stricker, who had his wife caddying for him, won the event alongside Sean O'Hair last year, demonstrating that this an opportunity to show the young pups that there's life in the old dogs yet. If Stricker (and O'Hair's) success had been a one-off then the argument that the aging pros have a big opportunity could be dispelled as hogwash but last year's result wasn't a one off. Kenny Perry won with O'Hair in 2012, at the age of 52, Scott Hoch was 53 when he won with Perry in 2008 and there have been a number of winning partnerships in their 40s. This is an event were the old guys get a chance to upstage their younger counterparts and it's definitely an angle-in. Early indications suggest Cameron Champ could well be the next big deal in the game of golf - combining prestigious power with a deft touch on the green but could this be a tournament too much for the new sensation, playing alongside a largely out of form, Kevin Kisner? Others are preferred. The world number five, Bryson DeChambeau, is making his second appearance in the tournament having finished plumb last in 2016 alongside Lexi Thompson, despite the pair opening up the event with a sensational 62. Bryson partners world number 45, Kevin Na, this time around and I wonder how that will go? Na, who's playing in the event for the first time, is a notoriously slow player and not someone I'd consider an ideal partner for a team event. This is an interesting pairing. A year after finishing dead last with Jason Dufner, Billy Horschel partners the man that won this event alongside Dufner in 2015 - Brandt Snedeker. Having finished fourth alongside Chris DiMarco (2013), Ian Poulter (2014) and Hunter Mahan (2015), Horschel was third in 2016 with his good friend Charley Hoffman, so apart from last year's aberration, Billy has a decent tournament CV and he clearly enjoys playing team golf given he and Scott Piercy won the Zurich Classic in April. 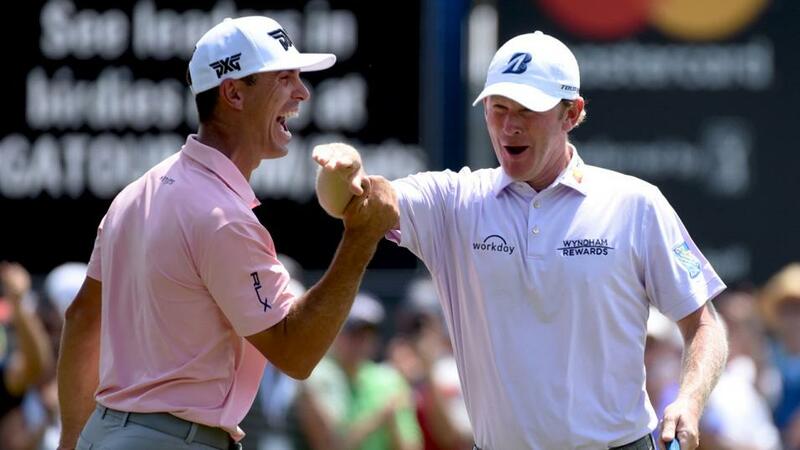 Although a winner of the event, Snedeker's form with other partners and in other years is ordinary at best but these two could just jell nicely and I can see them smiling their way to victory. I was tempted by the Horschel-Snedeker pairing but they've been well backed now and they're a fraction short for my liking and having backed last year's winners at 25/1, I was keen to side with them again this time around but they're a bit too short for me at present too. If either pairing drifts before the off, I'll get involved and I may even throw a few pounds at the rank outsiders Luke Donald and Andrew Landry. I'll check back on the market over the next few days but as of now, I'm without a wager.